There's still time to save on this year's Working 2 Walk Science & Advocacy Symposium - but only if you register by this Friday, September 7th. 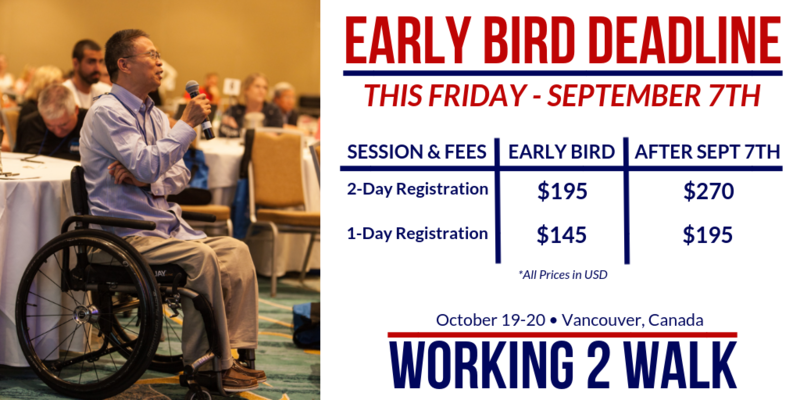 Individuals with a SCI can receive a 50% discount on their registration (in addition to the Early Bird savings through Sept 7th). We allow one Personal Care Assistant to register with them for free (see details on our registration page). And don't forget about another approaching deadline: Tuesday, September 18 is the last day to book a room at the Sheraton at our group rate. Check out our Venue/Lodging page for more information. We're looking forward to an informative, dynamic and rejuvinating gathering of the scientific and SCI Communities.